J.M. Snyder » Would it be beautiful or just a Beautiful Disaster? 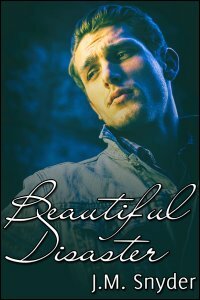 I’ve updated the covers for some of my earlier books, and one of the most recent to be redone is Beautiful Disaster. This is really one of my favorite novellas. I enjoyed these characters a LOT — obviously, since I also have a free story featuring them (Render) and a follow-up short story, as well (Encore). In case you haven’t noticed, I still love writing band fic. I started in boy band slash years ago and have never quite gotten over it!